On Oct. 12, I was honored to join advocates and consumers from Pennsylvania, Rhode Island and Michigan for a day in Washington, D.C. focused on person-centered care for Medicare-Medicaid beneficiaries. Our day was centered around the Alliance for Health Policy's Hill Briefing on Measuring Quality for Person-Centered Accountable Care, at which Center partner RoAnne Chaney of the Michigan Disability Rights Coalition was a featured panelist. She spoke on the importance of finding ways to measure and validate the effectiveness and cost-efficiency of a person-centered approach to health care. Outside of the Alliance briefing, we spent the day visiting key policymakers. Leadership of the Medicare-Medicaid Coordination Office (MMCO) welcomed hearing the perspectives of both beneficiaries and advocates regarding both the challenges and successes of the dual eligible demonstration projects in each state. We also trekked around Capitol Hill visiting the offices of Senators Bob Casey, Jr. of Pennsylvania, Sheldon Whitehouse of Rhode Island and Debbie Stabenow of Michigan. 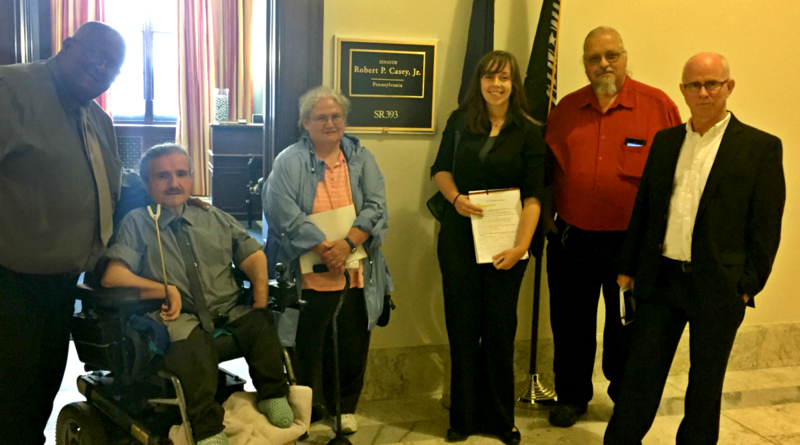 Our message to the senators: continue to protect Medicaid, particularly for Medicare-Medicaid beneficiaries. Why? Medicaid is an important lifeline for dual eligibles who are some of the most vulnerable populations in the United States with greater medical complexities and social needs and who make greater use of long-term services and supports (LTSS) than the population at large. This means efforts to provide care that is person-centered and better coordinated is especially important for these individuals – so they can live the lives they choose. These issues were made real by the beneficiaries themselves. For example, Sherman Pines, a consumer from Rhode Island who is enrolled in the Integrated Care Initiative (ICI), the state’s dual eligible demonstration project, and who also serves as the chair of the state's ICI Implementation Council offered his perspective. Sherman is 65 years old and has both Medicare and Medicaid. He has diabetes, high blood pressure and also limited mobility due to two knee replacement surgeries. Despite these challenges, he has assumed leadership in his community because, as he says, "helping people is my goal." His role on the implementation council empowers him to speak up and he says, "I feel like I now have access and I'm respected by the committee." When I spoke with Sherman after our D.C. trip, he said that for him the experience of being on Capitol Hill and visiting his senator was transformative: "To talk about the things we do in the ICI implementation council and see [the senator’s aide] listen to us, listen to me, listen to my stories…was the greatest thing. Somebody once told me, ‘don't just make them hear you, make them listen.’ And that’s what it felt like: somebody listening." That is our hope for a person-centered health care system. A system that listens to the person and addresses their needs, whether they are medical or social needs that affect their health. A system that empowers consumers to have a voice in the decisions that affect their health. A system that makes room for consumers to “co-produce” the solutions to our fractured approach to care. Programs like the ICI, which is part of the Financial Alignment Initiative, aim to better integrate Medicare and Medicaid services, provide meaningful care coordination and improve health outcomes. And now, three years into the demonstration projects, we are seeing preliminary evaluation reports from MMCO that are helping to build the evidence base for coordinated care for Medicare-Medicaid beneficiaries. While there is still a long way to go to truly assess the success of these programs, it is important to highlight what works and course correct other areas where needed. On my flight home, I reflected on the personal stories I heard and the power of the consumer voice. The bottom line is that consumer engagement at all levels (policy, delivery system, individual) matters – truly matters. And as Sherman told me, "I came back home and told consumers that someone listened to me and so they will listen to you, too." In addition to Sherman Pines, I was joined in D.C. by: Clark Goodrich, consumer from Michigan; Barbara Yorns, consumer from Pennsylvania;, RoAnne Chaney, Executive Director, Michigan Disability Rights Coalition; Ray Gagne, Executive Director, Rhode Island Organizing Project; and Erin Ninehouser, Consumer Engagement Manager, Pennsylvania Health Access Network. The Center offers its deepest thanks to the Valerie S. Wilbur Health Policy Fellowship Fund for supporting the consumers’ travel costs. Grants from this Fund are awarded to nonprofit organizations that specialize in programs for frail, disabled and chronically ill persons who are dually eligible for both Medicare and Medicaid. The fellowship program administered by these nonprofit organizations helps provide onsite, practical, short-term, real world learning experiences for legislative and regulatory staff in Washington D.C.